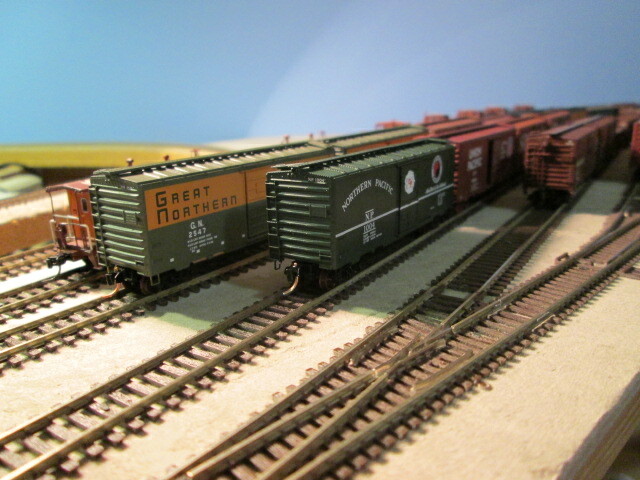 Perfect fit for a standard N scale box. 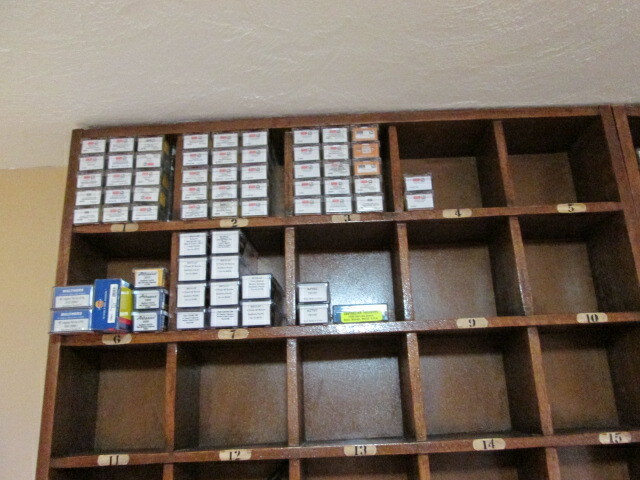 I always keep the boxes, and storing them while being able to read the end label has not been feasible before. 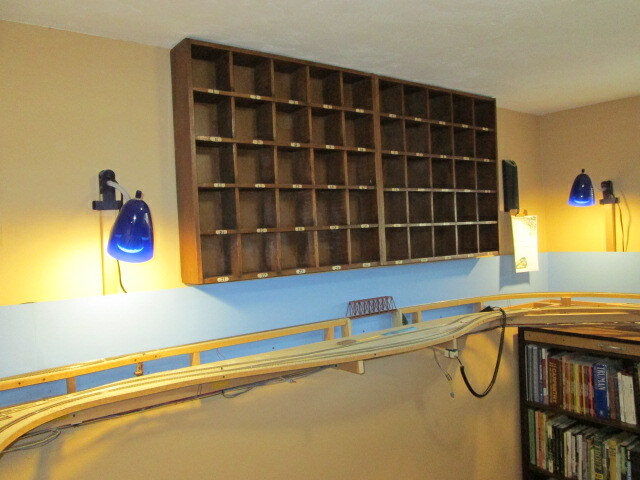 The cubby shelves worked out well. 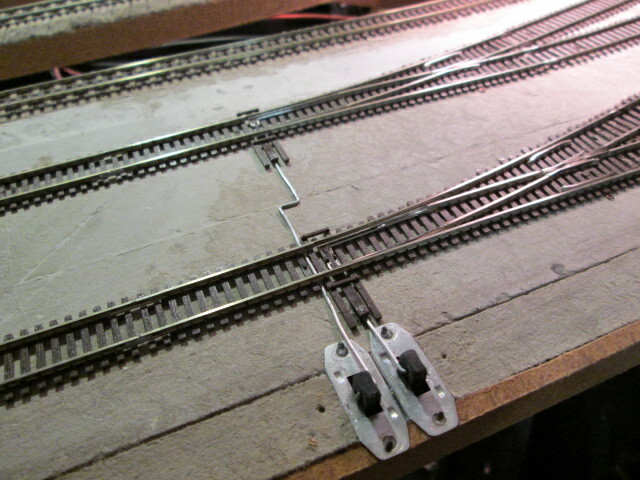 The switch activation levers project is complete in Willoughby Yard. This worked out after all. I like simple controls, and while this is not exactly prototypical, once the scenery is installed, this will be okay, I think. 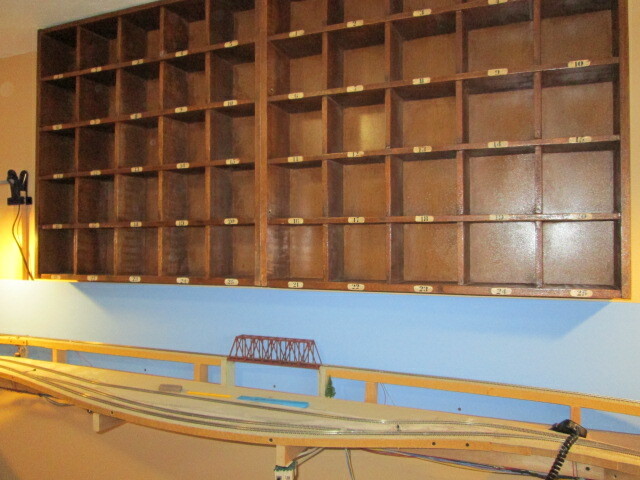 I got sidetracked from the switch activation levers project when the new cubby storage shelves arrived. I had hoped to find something like this at an antique store or swap meet, but after 6 months of looking, I had came up empty handed so I ordered some from Pottery Barn. I was disappointed that the top end of one of the units had been damaged (it had a little shoulder of wood that stuck up above the shelf that had been crushed). I called PB and they were very nice in offering a discount on the damaged unit. 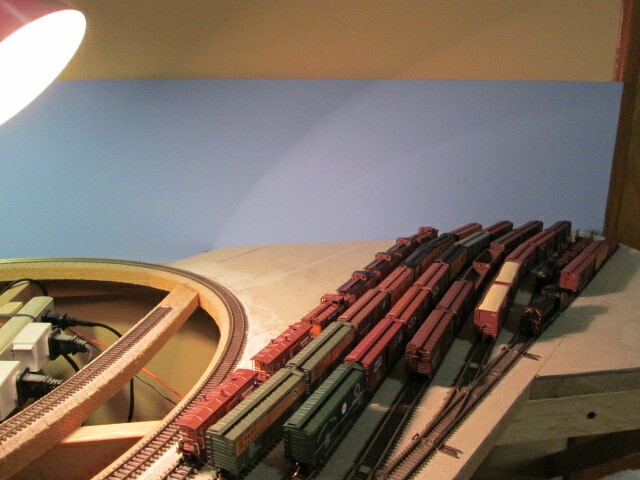 When I held them up to the wall, I noticed that the shoulders would need to be removed on both units anyway in order to get the shelves to fit above the backdrop. 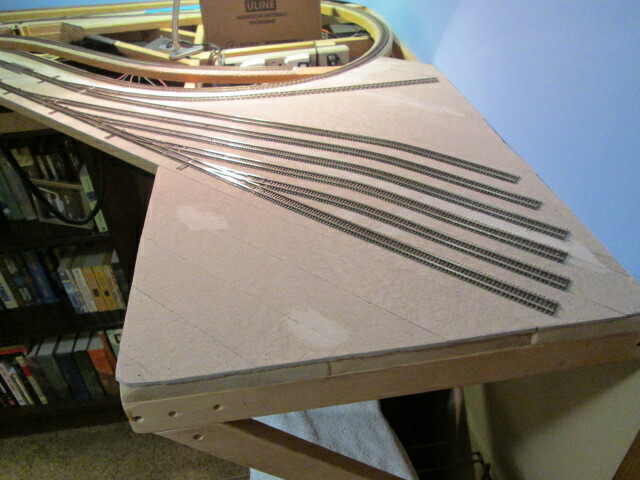 Turns out that after cutting the shoulders off with the table saw, no further repair was needed. 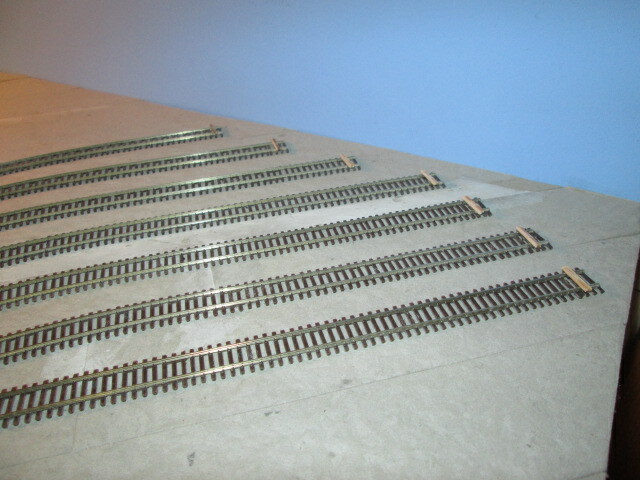 These were not easy to get lined up and hung on the wall because the mounting hardware on the back of the units were not consistently installed in the same place on the back of each unit. Other than that, I’m quite pleased with the result. 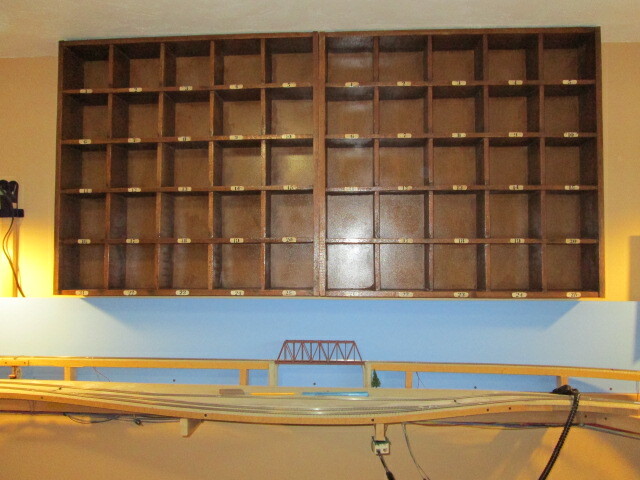 I can use this for train car storage cases or operational tickets, or other essential model railroading detritus. 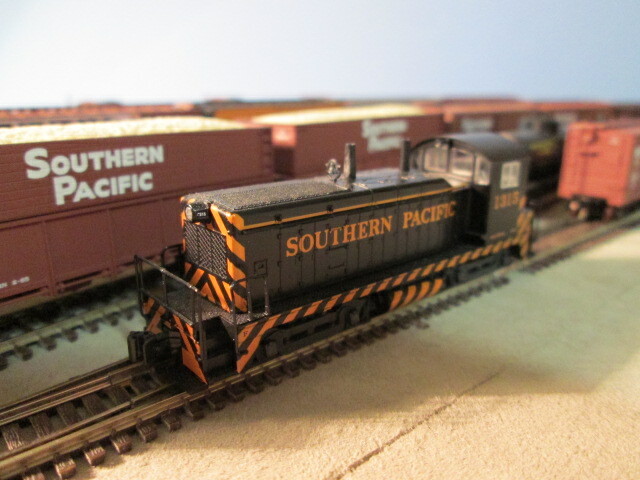 I did a little research regarding how the Southern Pacific Railroad terminated yard and spur tracks and learned that sometimes they used a mound of dirt and other times a few railroad ties were stacked on the track ends. 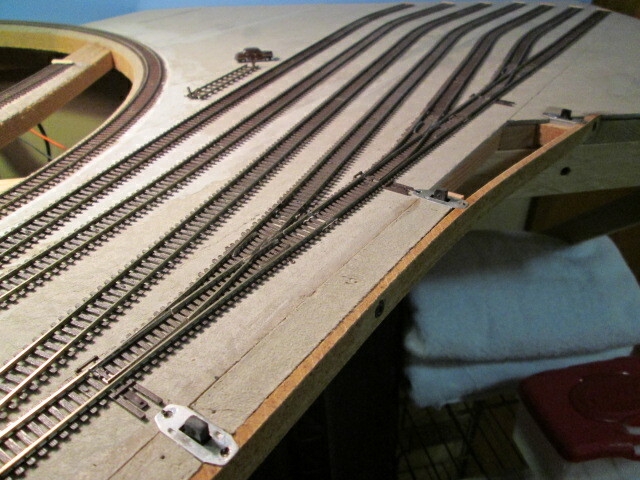 What I had previously built was not close to the prototype, so I removed the vertical and angled wood ties and left the ties laying across the track. 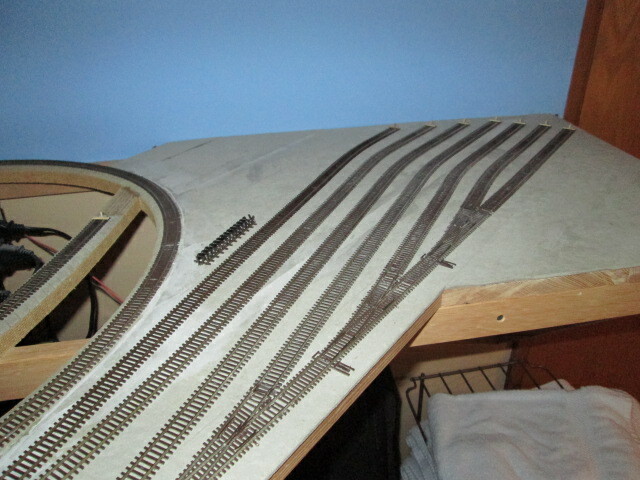 SP generally stacked three, so I’ll be adding an extra one to each track end in the future. 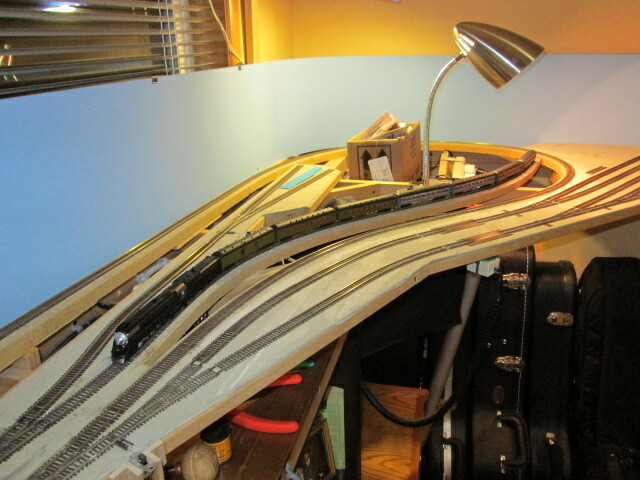 I was also having a bit of a struggle designing how the edge of the railroad would be along Willoughby Yard, as the switch mechanisms would protrude from the side of the layout and needed to be protected in some manner. 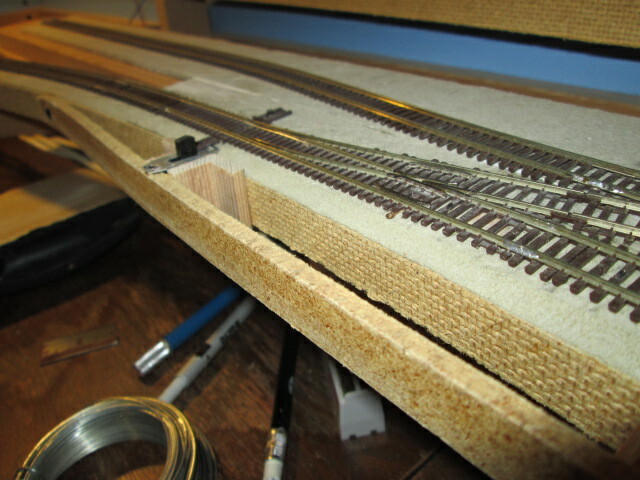 Once again, masonite splines to the rescue! 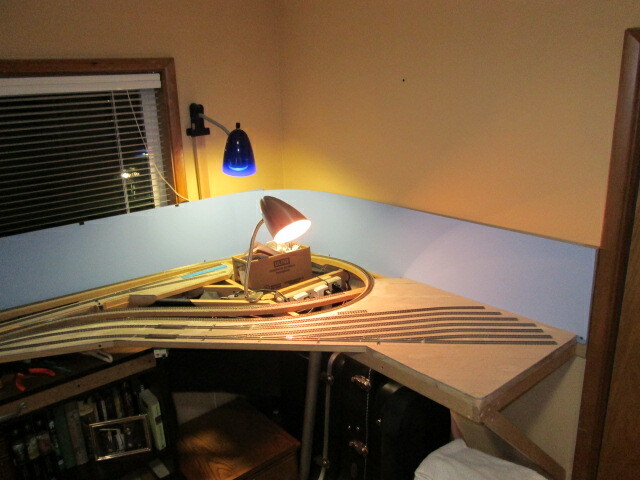 I got all the switch mechanisms in place with some scrap wood and glue, and built a little protective facia that should shield the switches from being caught on clothing, etc. 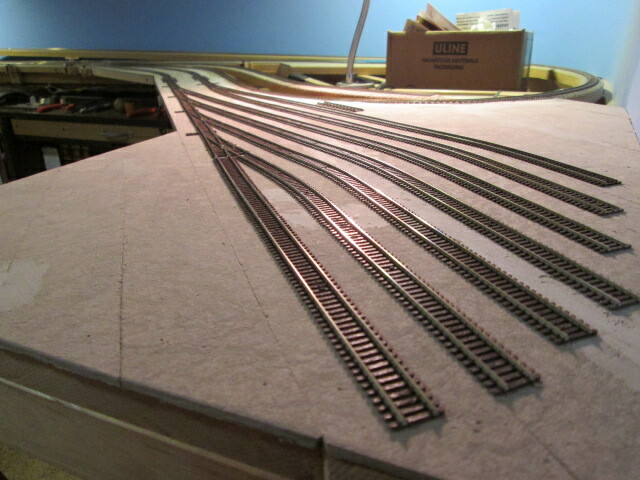 Later on, the main facia will be installed along the edges and the edge of the railroad will be smooth and seamless. The only downside of this design is that I will have to fill in the gaps created by this protective facia, but should be able to do this with the hardshell scenery. 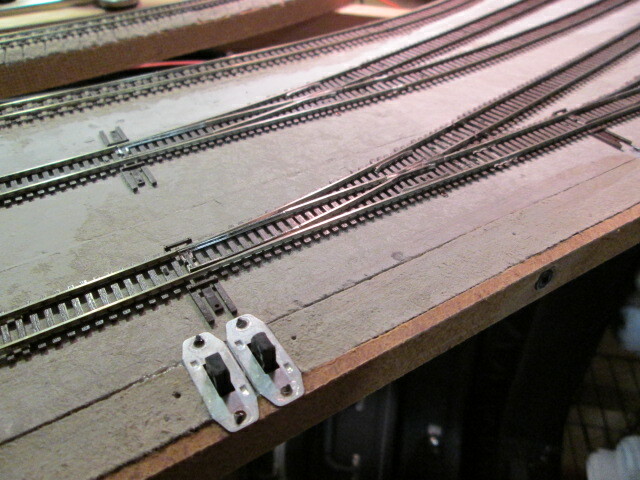 I did not have the time or the energy today to install all the actuation wires connecting the switches to the -er… switches, but that will be a project for another day. 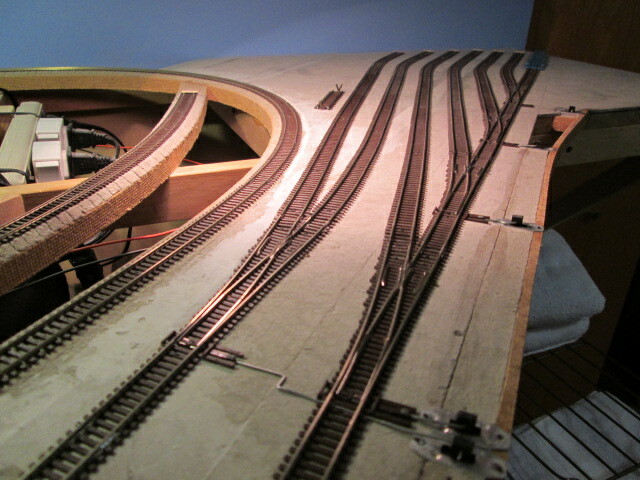 Installing the wires to move the switches is detail work, which I enjoy doing, so I’m actually looking forward to doing this next session. 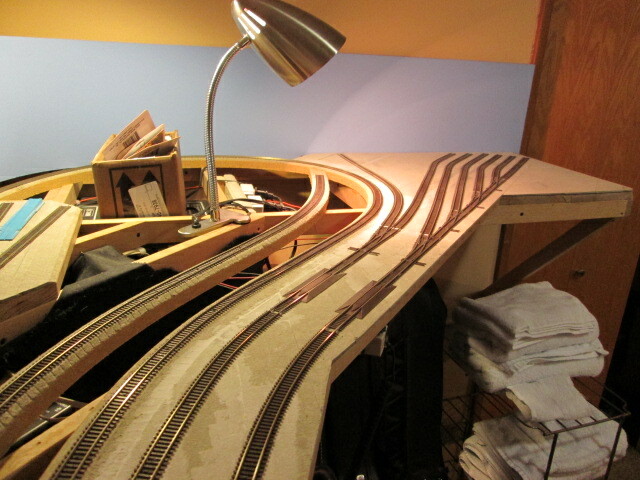 I may wire the yard and industrial spur before moving on to the small logging yard at Big Fir Enterprizes up the hill from Rock Ridge. 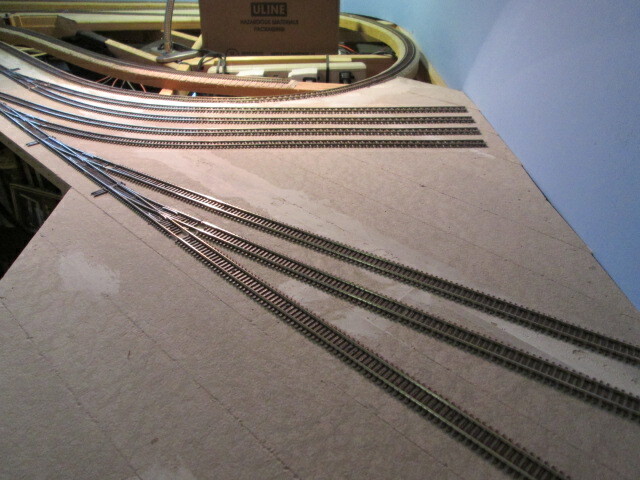 That way, I could enjoy running a few trains into the yard sooner rather than later. That’s all for today! 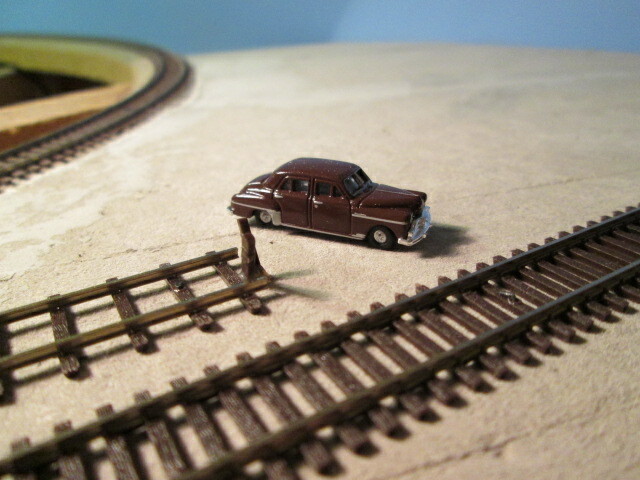 I picked up a couple of Mini-Metals cars from my local hobby store (LHS), Eugene Toy & Hobby. 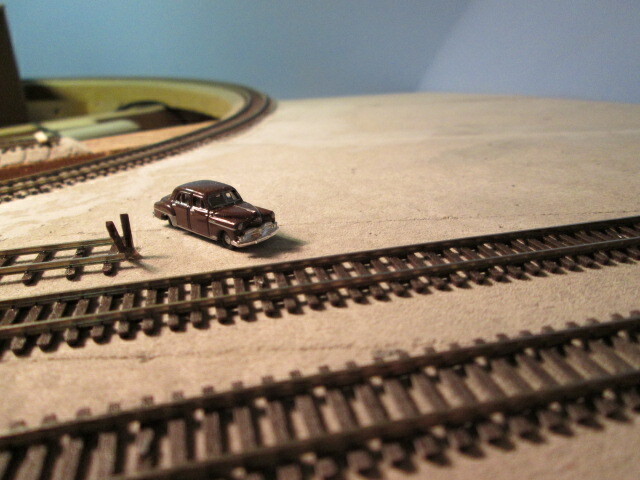 They are the correct scale and era and will be a nice addition to the scenery. Just did a little clean up on Willoughby Yard today. 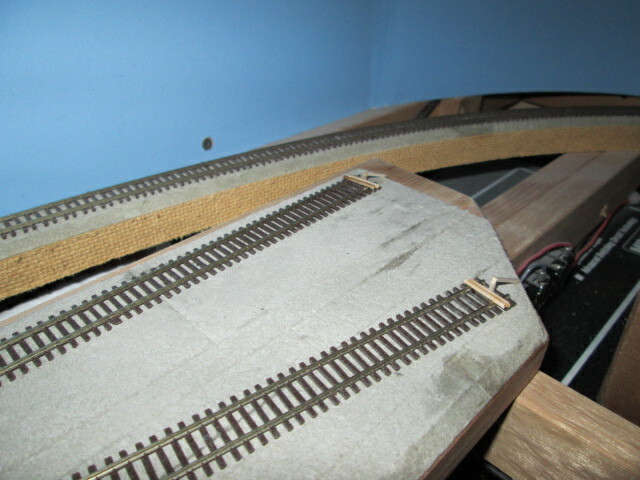 Inserted some sleeper ties under the rail joints so it all looks a bit more real. 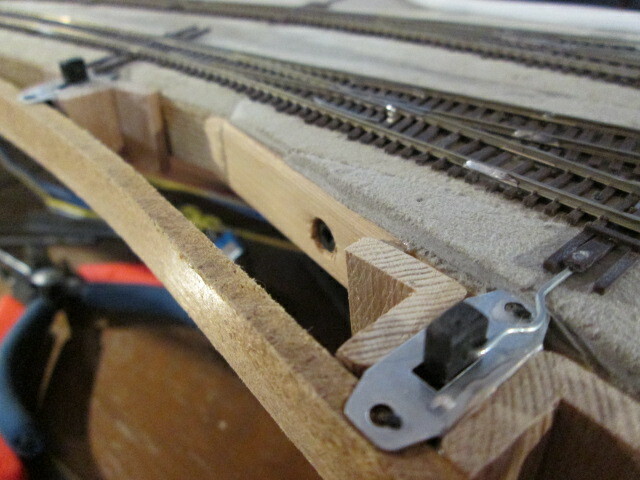 Also added some bumpers constructed of wooden ties to keep cars from running off the end of the track at various points around the layout. 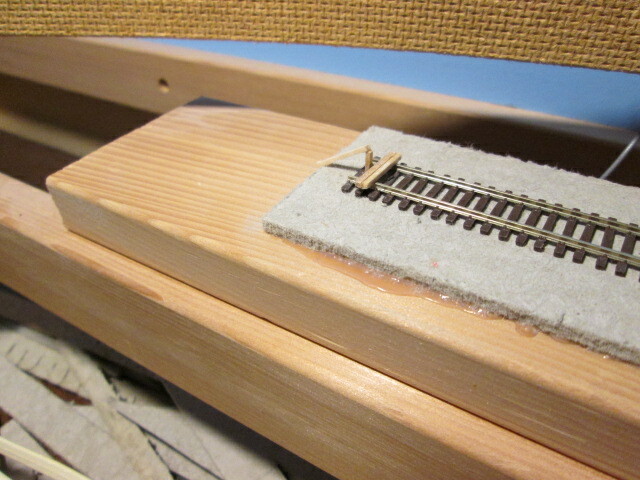 I did a little research (The Southern Pacific in Oregon, and The Southern Pacific in Oregon Pictorial) and found that the SP frequently would put 1-3 railroad ties on the end of a track parallel to the ties for this purpose. 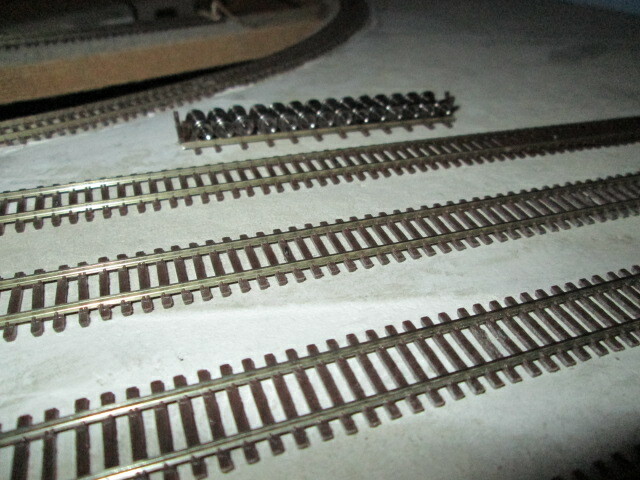 I found a handful of spikes and more or less completed the track work for Willoughby Yard today. 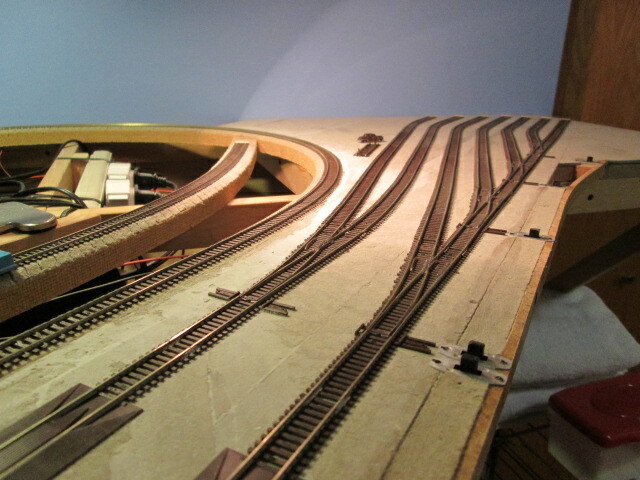 Lots of work remaining, however. 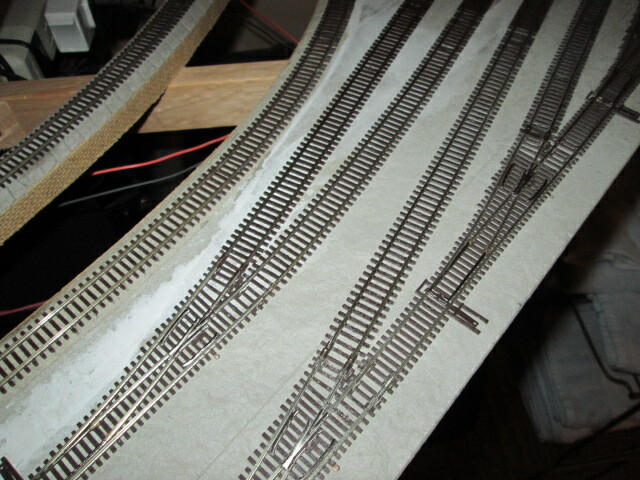 Wiring has not been done, and switch activators have not been installed. 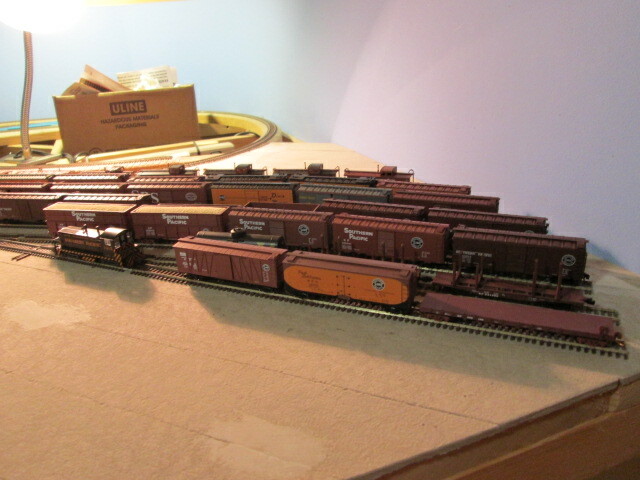 I filled up the yard with cars tonight and it holds just about 38 cars, give or take a few. 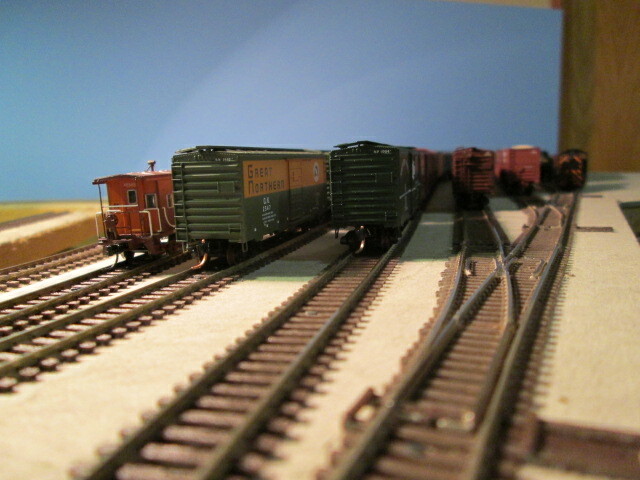 I think this yard will serve the purpose intended; to assemble trains to send over the line for operation sessions. Time will tell. 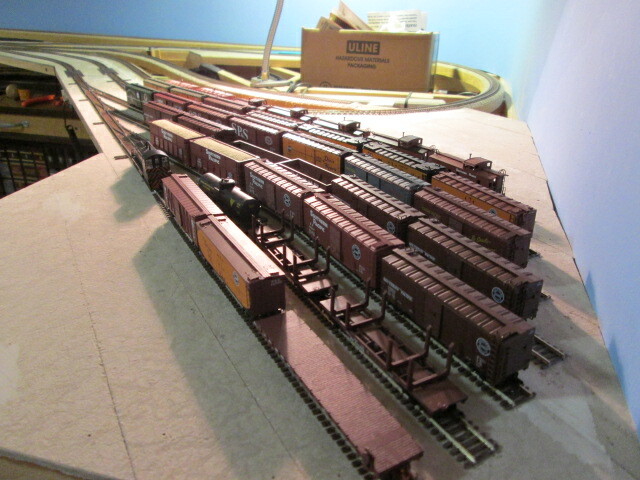 The images below are of the yard with some assorted cars awaiting assembly into trains. 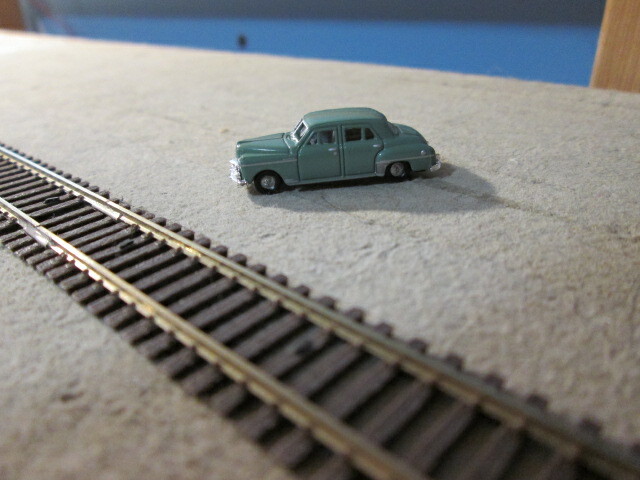 And last, but not least, some passenger car photos on the Willoughby Passenger Spur. 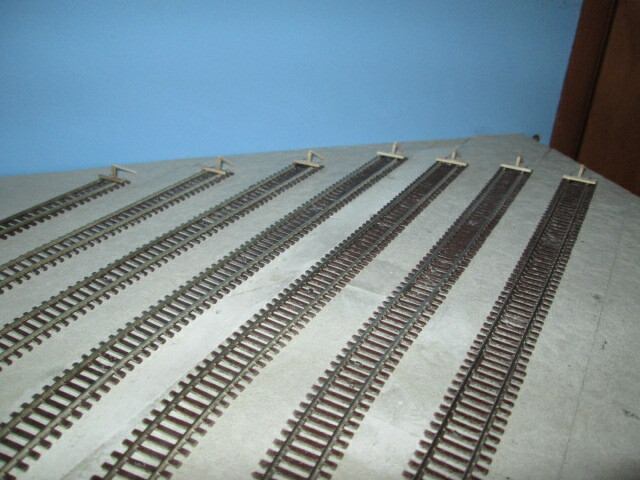 The small track at the bottom of this image will be a wheel storage track. 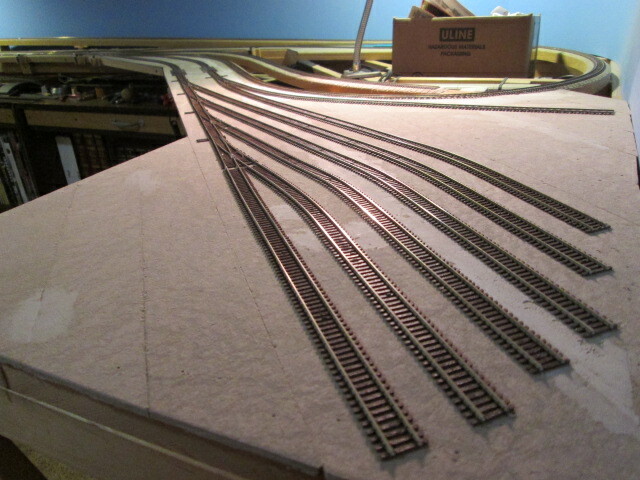 As alluded to in my prior post, I did not follow my plan when installing track in Willoughby Yard, so I have rerouted most of the track and am closer to the design plan. Not that close, actually, but closer than I was. 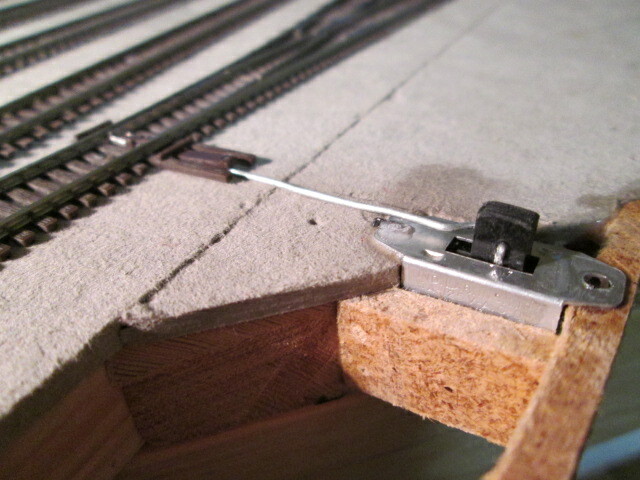 I love to use Micro Engineering track spikes to hold track down. Pulling it right back up is equally easy. 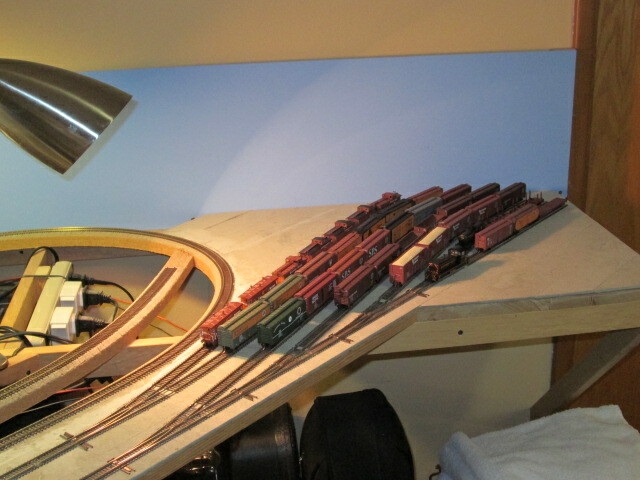 Unfortunately, I ran out of spikes and have placed a new order with FastTracks. 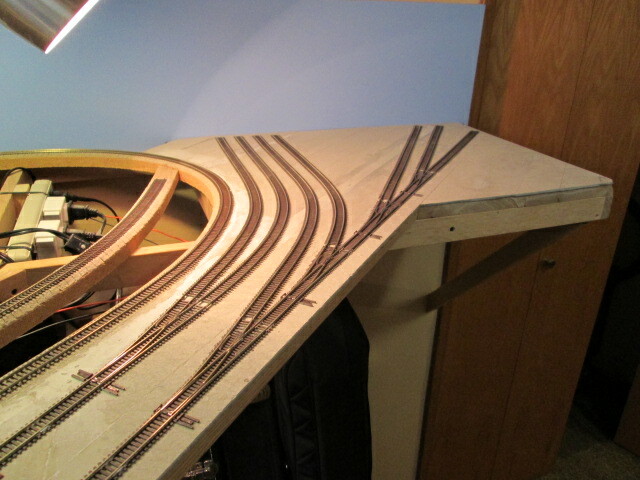 When the spikes arrive, I can reroute the remaining section of track that needs to be moved. 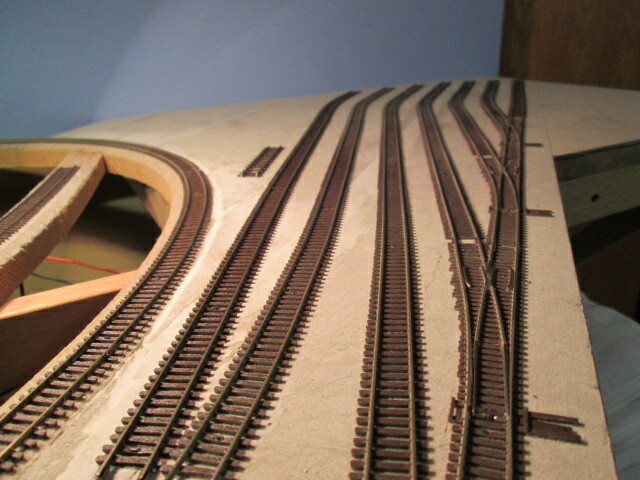 I think this layout is a much more efficient use of space and is closer to the original drawings. 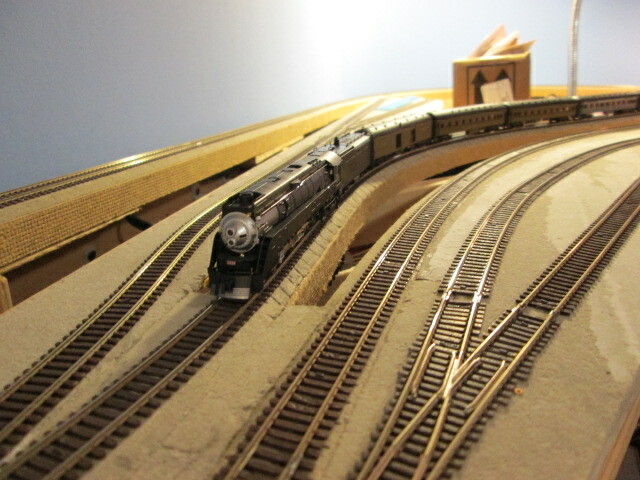 I attended the Willamette Cascade Train Show today at the Lane County Fairgrounds and took my father along for the ride. We checked out the tables of trains, books, and everything railroad-related but did not find anything we could not live without. 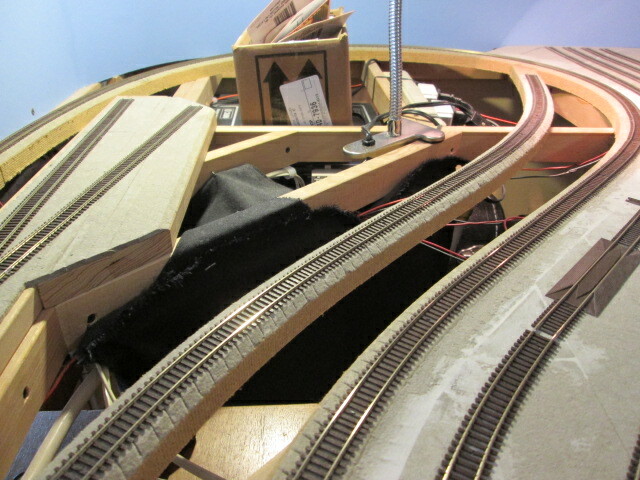 Willoughby Yard is the largest yard on the layout. 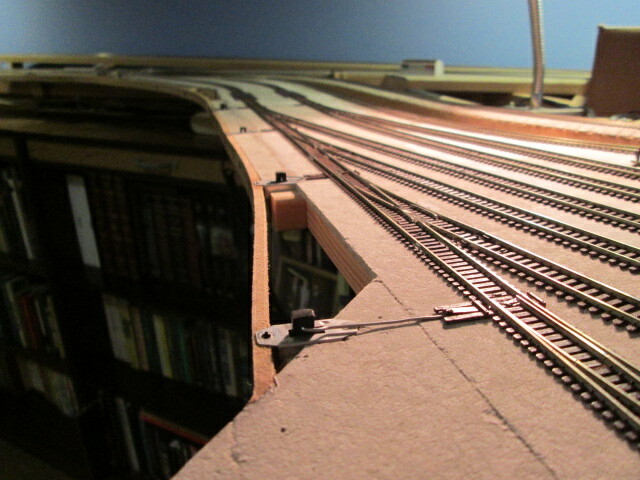 Photo 2 shows the passenger spur, which is technically part of the Willoughby industrial track. 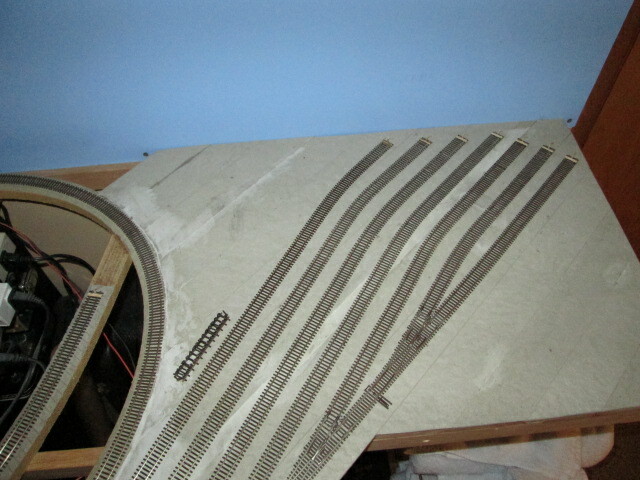 I completed the homosote roadbed this week after my order arrived. I really love this product. 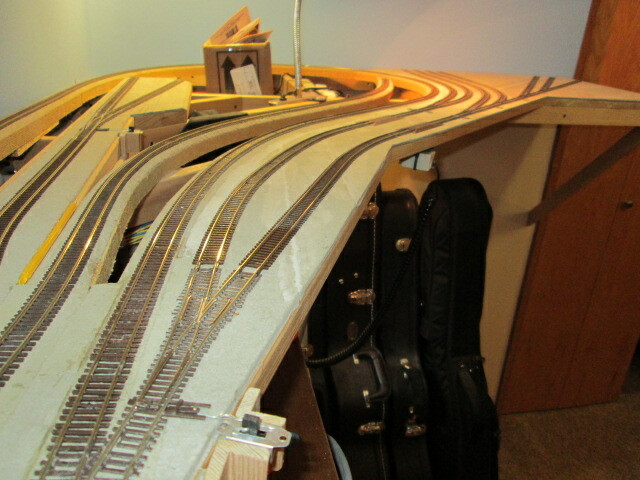 Got some track down, but I did not follow the plan and will relay the track soon. 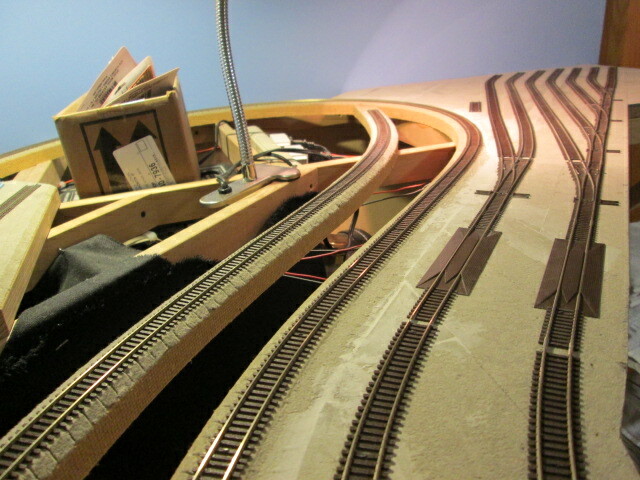 I’m concerned about a couple of things; the curve on the yard tracks is not ideal, and the end of the straight track will need to lead into an engine servicing building, but without the building, I don’t know exactly where the track will need to be. 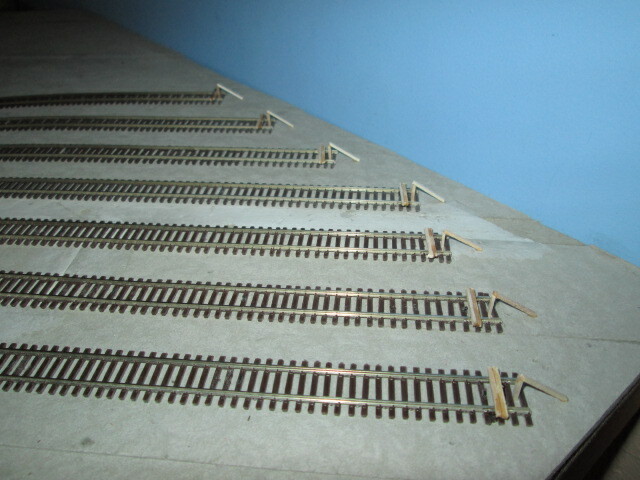 Fortunately, using spikes to put down track means it can easily be taken back up and moved. 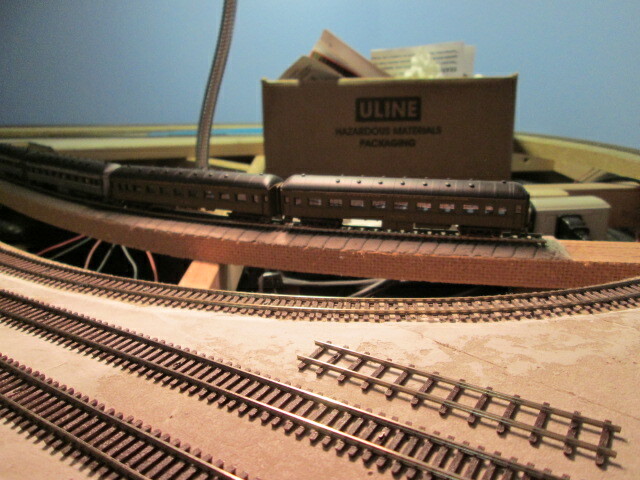 The Eugene Train Show is at the Lane Fairgrounds this weekend and perhaps I can find a nice engine shop building. Hope springs eternal!